Over the spring semester, my Type Design class gathered the incomplete woodtype families in our school's print department, redesigned the missing characters, and used a CNC router to cut the new characters. It was kind of crazy, really stressful, super ambitious, but so damn fun and fulfilling. We all worked together to figure out what characters were missing, how much were missing, and what typefaces would be practical projects to tackle over the course of a semester. We ended up selecting three altogether! One serif and two sans serif. I worked on the seriffed font with a team of three others. We printed proofs to study the typefaces and to keep track of the characters we were designing. We spent most of the project designing and revising the new characters. Every class we would present new revisions. I knew type designers had to be patient, but I had no idea designing type required THAT much patience. It's crazy. But we learned so much in the process about type design in general. We've cut all two of the three typefaces so far. My team's typeface is the very last one, which will be finished over the summer. This project was such an amazing experience and I'm so happy I had the chance to be a part of it. 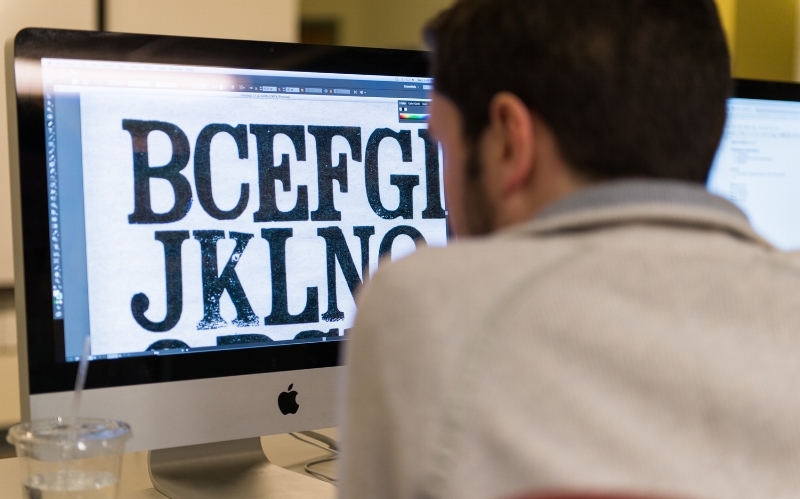 We got to work with multiple mediums and now our print department has a few full family sets of wood type to use. Quite a project, but such an accomplishment.